This week, I’ve got rather lost in season one of Game of Thrones, courtesy of a blu-ray box set. That I love this show is no surprise at all. I’m entirely predisposed to do so, as I adore the book it’s based on, and the adaptation of that extraordinary novel is both sumptuous and accurate. The casting is superb, and they’ve captured the most groundbreaking element of the story (the gritty humanising of a fantasy world) with deceptive ease. What’s on screen is the most uncanny depiction of a story that previously existed in the mind’s eye since Jackson’s Lord of the Rings. It’s rightly lauded for its production, performances, and bold storytelling, and a delight to see realised so well. What’s more surprising is that my wife loves it too. While Kirsty and I share many of the same tastes, nothing from the fantasy genre has ever convinced her that my love it it is anything but an aberration. Even the Lord of the Rings, which she enjoyed for about an hour, was eventually dismissed as just an endless series of walks, talks, and fights*… with unexplained elves in it. I’d given up all hope that she might one day be turned around, but then Game of Thrones came along. She’s as hooked as I am, probably more so as she has no idea what’s going to happen next (shhh… we’re on episode seven, so by my reckoning her jaw’s going to hit the floor very soon – no spoilers!). Of course, it’s not the production or performances that have snared her – a like for like comparison with LOTR shows there’s little between them on that front. Both are visually arresting, lavishly produced, and feature excellent central performances. It’s the story that makes the difference. In particular, there are two aspects that have made this the fantasy story that people like Kirsty can finally get to grips with. The first one, worn on the show’s sleeve, is the reality of the world. 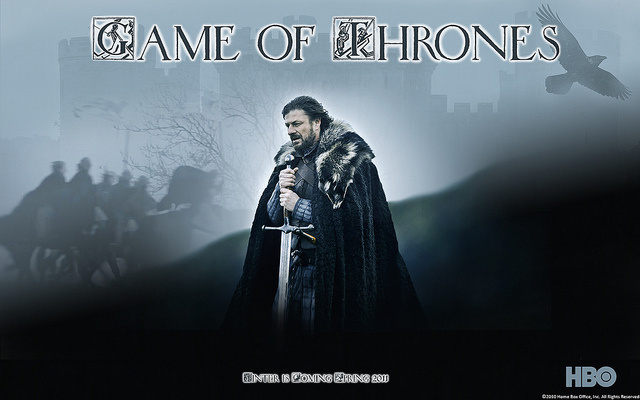 Many reviews and appreciations have stated that Game of Thrones is fantasy with the emphasis off the fantasy. They’re quite wrong. If you’ve read the books, you’ll know that more overt fantasy elements are woven through this world and story. The difference is that George R.R. Martin is playing them like a horror writer (and yes, I know there’s plenty of horror to be had in both the show and the books – not surprising, if you look through the breadth of Martin’s back catalogue). A good horror story gives you a real world, with real people in it. The horror elements – often something fantastical that you don’t expect to find in a real world – emerge slowly, a little at a time, bleeding into the tale until they dominate it. Because the horror element is the hardest thing to sell to the reader or viewer (hence the eye-rolling when you watch a clumsily executed horror film), it only works as it should when the ‘real world’ of the story is established well. When you recognise the world you’re watching, and the characters as real people you can relate to, then the horror becomes all that more affecting when it starts to tear down the walls. In literature, you don’t have to look further than Stephen King for countless examples of stories where your reaction comes from not wanting these terrible things to happen to these people. Martin sees no difference between fantasy in Game of Thrones, and horror. First he gets the story going – the families, the politics, the almost historical reality of the piece (visualised very much as history, for an even easier connection), then he starts to drip feed the fantasy into the book, building it slowly, letting the characters be amazed and terrified by the strangeness, just as the viewers are. Game of Thrones has also managed the rare trick of being event television, without an actual event. In Homeland, the whole show is driven by the question of how one man becomes a terrorist, and whether he can be stopped. In Dexter, everything stems from the central character’s hidden nature as a serial killer. Once Upon A Time is… the most inept piece of storytelling I’ve ever seen, actually, so that’s a bad example, and a blog for another time. 24 was a race against the clock, to stop specific events. And so on, and so on. Game of Thrones is none of these. There are certainly threads that underpin the thing, notably the question of who will one day rule Westeros, but you don’t see the trailers for each episode teasing you with who might one day be king or queen. The battle for the throne is just something that’s happening in that world. It’s not allowed to disrupt the exploration of relationships and personal choices. We happen to be watching events in Westeros at a certain moment, where the choices of a few have created a particularly interesting time. However, if we’d joined twenty years earlier, perhaps when Robert and Ned rebelled against the Mad King, with the unplanned help of the man who would one day be called ‘Kingslayer’, that would have been just as involving. I’ll be fascinated to find out how Martin is going to stop his sequence of novels. I doubt he’ll be able to ‘end’ the story, because it’s about the lives of the people involved, and some of those will go on beyond the final page (notorious thought the series is for killing the people you think most likely to survive!). By daring to be a vast and multilayered saga, event television without an event, Game of Thrones reaches to an audience who couldn’t care less whether one ring may or may not rule them all. To cut a long story short, it’s Dallas, with swords. Think on. Oh all right, it isn’t. Dallas, and most soap operas, deal with archetypes. Fantasy usually does this too, establishing character ‘types’ and letting them loose. Even the plots are of a ‘type’. Nobody, beginning The Lord of the Rings, can be in any doubt whatsoever that the forces of darkness will be overcome. There may be terrors along the way, but storytelling convention demands that the Ring is destroyed, and order returns to Middle Earth. Everybody who watched Dallas knew that JR would get his comeuppance at some point, even if he was never brought low for long. In Game of Thrones, it’s hard even to tell what the forces of darkness actually are. I’m too early in the series to see it realised on screen yet, but in the books none of the good guys really are good. None of the bad guys are bad either. Just like you and I, they are all shades of grey. There are only two men of genuine honour presented in the first season, and their fates tell you all you need to know about the nature of the world they’re living in. Ned Stark is immediately recognisable as one, and we mark him straight away as the ‘hero’. Yet we soon discover that he’s only survived as such by ostracizing himself in the North, where life can be as he sees it. Once forced to go south and rejoin the rest of the world, his physical and emotional deteriorations are brutal (and how brilliantly does Sean Bean play them?). There are few places for men of honour and idealism in Westeros, and that must be familiar to all of us, as we look around every day. Nobody gets to be wholly good or wholly bad in real life, however much they want to. Jon Snow is perhaps the second honourable man, and by episode two of the series he’s already on his way to the only place in the land where he might be allowed to remain so – the brutal world of the Wall, where the balance between life and death is such that it allows for absolutes. There, it is possible to be good or evil, to set your store in one camp or the other, but the sacrifices that must be made to get there are themselves brutal. For the rest of them, and the rest of us, there are no absolutes to cling to. We, and they, are defined by the choices we make at any one time. Yet there’s always another choice approaching, with another definition to carve out for ourselves. So, is that why Game of Thrones reaches so far beyond its natural audience? It’s certainly what works for me, and is what draws me most as both a reader and a writer. I’m fascinated by how people respond to fiction though, so tell me – why does it work for you? Assuming it does, that is. If it doesn’t, tell me that too. Why doesn’t it work for you? Answers on a postcard, please**. ** or, obviously, in the comments below, if you have any to make.